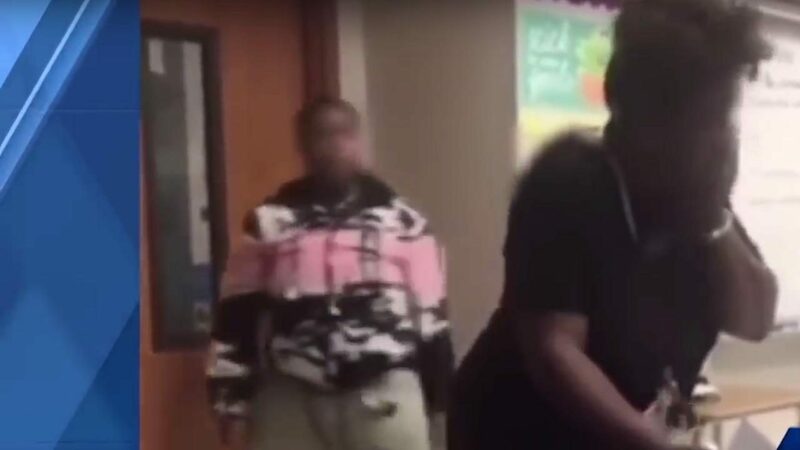 A 17-year-old female was caught on video punching a chemistry teacher in the face inside a classroom at Frederick Douglass High School in Baltimore last week, WBAL-TV reported. It appeared two female students were tussling near the classroom door Wednesday while the teacher was speaking to other students out of frame. Suddenly one of the tussling students pushed the other one away and then punched the teacher on the left side of her face; the teacher turned away in apparent pain and covered part of her face with her hand. “What the f*** you talkin’ ’bout?” the student could be heard saying. “Don’t f***in’ get smart with me. Straight up.” The student then walked out the classroom door. The teacher responded, “I didn’t get smart with you,” and then followed the student out the door and appeared to be speaking to someone else about the incident before the video ended. The teacher’s name wasn’t reported, but WBAL said she’s “a highly regarded state science educator and a respected elder at a local church.” She wasn’t seriously injured, the station said, adding that the teacher wasn’t in class Thursday. What are school officials saying? Marietta English, president of the Baltimore Teachers Union, told the station she was “angry” about the incident. “Of course, I was very angry when I saw that because we’ve asked that there be some kind of support for our teachers, and something needs to happen,” she added to WBAL. What are local people saying? “Of course, I was very angry when I saw that because we’ve asked that there be some kind of support for our teachers, and something needs to happen,” Correct. Call police and charge student with assault. Haul to jail. Next question? This is one of about 38 examples seen in the news daily why Blacks should never be allowed in human schools, mass transit, malls or amusement parks. I can tell you what would have happened to me 65 years ago when I was in high school. My football coach would have grabbed me by the collar and slammed me into the lockers. I got this for a mild mouth off. It was UNTHINKABLE to even contemplate raising a hand at a teacher. This girl should be thrown out of school until she makes sincere amends to all involved. I would throw in the proviso she get down to a healthy body weight. Her poor female self image is no doubt a large part of her ANGER. School officials condone this crap and then expect the students to act appropriately. Expel this student. Announce that anyone hitting a teacher gets expelled, then do it. This isn't rocket science.